Today, Pope Francis received in audience participants in the General Chapter of the Society of the Catholic Apostolate (Pallotines). Here is a ZENIT translation of the Pope’s address to those present. I am happy to receive you on the occasion of your 21st General Assembly. I greet you cordially and I thank the Superior General for his words. I extend my greeting to all the members of the Society of the Catholic Apostolate and to all those who share the charism of Saint Vincent Pallotti. He became an illuminating beacon and inspirer in the Church. His charism is a precious gift of the Holy Spirit, because it aroused and arouses various forms of apostolic life and spurs the faithful to commit themselves actively in evangelical witness. Your Founder understood that to be able to live communion with God, Jesus must be at the center, “the Divine Model of the whole human race” (Complete Works II, p. 541). In this Holy Year of Mercy, I like to recall that Vincent Pallotti had the gift to recognize that Jesus is the Father’s Apostle; great in love and rich in mercy is He who fulfils His mission revealing to all the tender love and infinite mercy of the Father. This mystery of God’s paternity, which opens to each one through the work of the Son, His heart full of love and compassion, acquires a special significance in our times. Every day scenes of violence, merciless faces and hardened and desolate hearts pass before our eyes. We are in so much need of remembering that Father whose heart thinks of all and wants the salvation of every man. Mercy is “the force that conquers all, that fills the heart with love and that consoles with forgiveness” (Bull Misericordiae Vultus, 9). The reflections of your General Assembly are focused on the following words of your holy Founder: “The fundamental rule of our little Congregation is the life of our Lord Jesus Christ, to imitate Him with humility and trust with all the possible perfection in all the works of the hidden life and of the public evangelical ministry” (Complete Works III, p. 40). In the light of these valuable pointers, every member of the Pallotine Family is called to put the person of Christ and the faithful following of Him, as the foundation of his existence. Contemplating the life of Jesus and looking at our life as pilgrims in this world with so many challenges, we perceive the necessity of a profound conversion and the urgency to revive faith in Him. Only in this way will we be able to serve our neighbor in charity! Every day we are called to renew our trust in Christ and to draw inspiration from His life to carry out our mission, because “Jesus is the first and greatest evangelizer. The primacy in any form of evangelization is always God, who has willed to call us to collaborate with Him and to stimulate us with the strength of His Spirit” (Apostolic Exhortation Evangelii Gaudium, 12). Dear Brothers, I encourage you to continue your journey with joy and hope, committing yourselves with all your heart and all your strength, so that the charism of your Founder bears abundant fruits also in our time. He liked to repeat that the calling of the apostolate is not reserved for some, but is addressed to all, “regardless of their state, their condition, their profession, their fortune, all can take part” (Complete Works IV, p. 346). 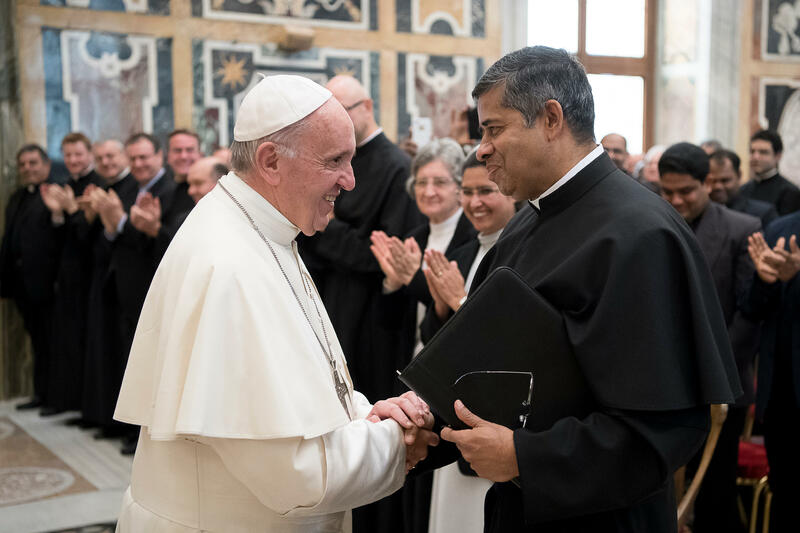 The Union of the Catholic Apostolate, which is bearer of Saint Vincent Pallotti’s charism, offers many areas and opens new horizons to participate in the mission of the Church. Therefore, it is called to work with renewed impetus to reawaken faith and rekindle charity, especially in the weakest segments of the population, poor spiritually and materially. In this, you are supported by the example of so many of your fellow brothers, genuine witnesses of the Gospel, who dedicated their life to the service of others. I knew them also during my pastoral service in Argentina and I have a happy memory of them. Following in the footsteps of Saint Vincent Palloti, who considered himself a prodigy of God’s mercy, you can help all those you meet in your minostry to rediscover the immense love of God in our life. He wrote: “O my Jesus, shining in you is the incomprehensible excess of your infinite love and your infinite mercy” (Complete Works XIII, p. 169). I entrust you all to the protection of Mary Most Holy, whom Saint Vincent Palloti venerated in a particular way as Queen of the Apostles. She, effective example of apostolic zeal and perfect charity, invites us to incessant prayer to invoke the gifts of the Holy Spirit on today’s apostles, so that her Son’s Gospel is proclaimed in every part of the world. I also entrust myself to your prayers and, while I hope for the best fruits of the works of your Assembly, I impart to you my heartfelt Apostolic Blessing.